"Unaccustomed to public speaking as I am..."
is the type of thing that leaves me feeling anxious, weeks and months in advance, and I don't enjoy enjoy myself at the time, either! Yes, it's fair to say that I have (or rather had) a public speaking fear. I really noticed my fear of public speaking when I stood up to read a short story I'd written to a group of strangers (mostly) in my local library, one evening as part of Holmfirth Artweek in 2008. I made a mess of my introduction (unrehearsed), and soon after my throat became incredibly dry, and I started to shake the paper that I was reading from. It was the dry throat thing that disturbed me most, and I had no idea what to do with it except to gulp on imaginary fluids in my mouth and to read on. Yuck! I did not enjoy this experience and pretty much decided then and there to take a public speaking course (see details below). And that's when I discovered that 'dry throat' phenomena is quite a common symptom of public speaking phobia. Funnily enough, I really enjoyed the presentation skills course - I was a bit of a star, don't you know! - and it gave me an appetite for performance. Yes, performance! I now want to do a stand-up comedy course - not because I'm a funny man or anything (heaven forbid! ), but because this seems like the ultimate 'public speaking fear' challenge - I want to sing in a karaoke bar (this is something that you would NEVER have heard me say even a few years ago), and I want to even be in my own band! NOTE: one solution I also tried - and it helped, for sure - is a self-hypnosis download from HypnosisDownloads.com. It's a short MP3 hypnosis script all about fear of commitment. Just sit down, listen, absorb... It's that simple! 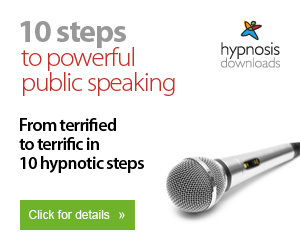 ...Which leads me to what Edward Hope says about public speaking fear. Do the thing you fear! Concentrate on doing your best, and be happy with that. Again, this applies to any fear and is a benefit of having a positive attitude. Much better to respond positively to your mistake than negatively - for you and the audience. ...And practice, practice, practice. Even people with seemingly no public speaking fears like US presidents Obama and Clinton practice their speeches over and over again. 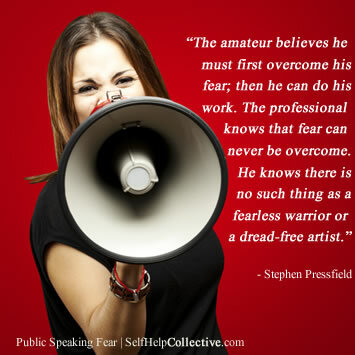 Share this public speaking fear page - thanks!